. Arts J, King P, Marin A, et al. 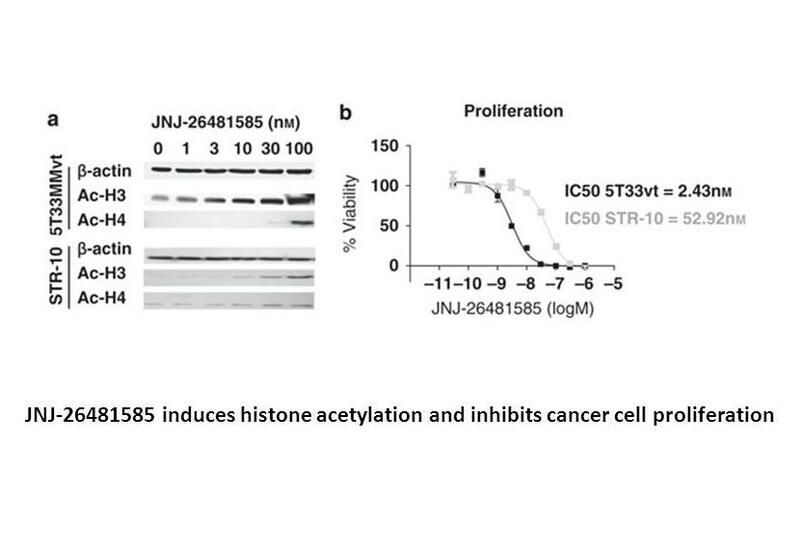 JNJ-26481585, a novel "second-generation" oral histone deacetylase inhibitor, shows broad-spectrum preclinical antitumoral activity. Clin Cancer Res, 2009, 15(22): 6841-6851. 1. Initial testing (stage 1) of the histone deacetylase inhibitor, quisinostat (JNJ-26481585), by the Pediatric Preclinical Testing Program. Pediatr Blood Cancer. 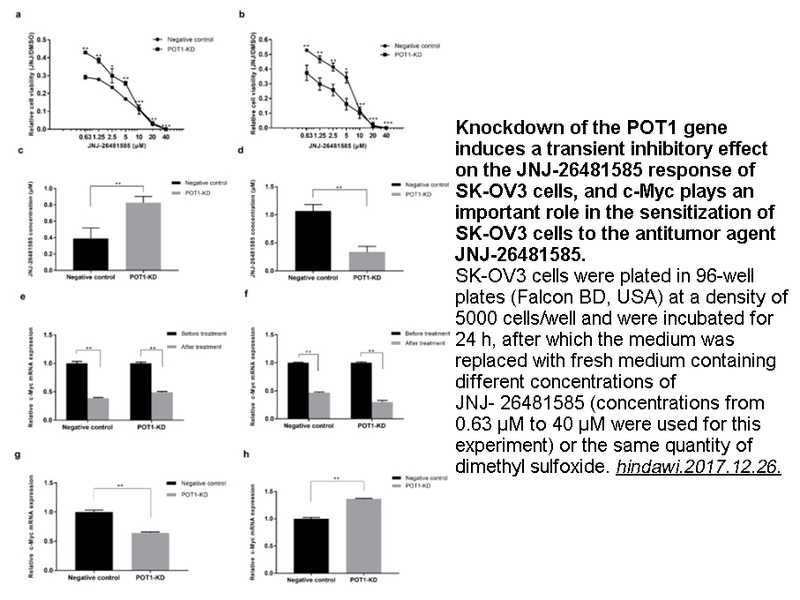 2014 Feb;61(2):245-52. doi: 10.1002/pbc.24724. Epub 2013 Sep 4. 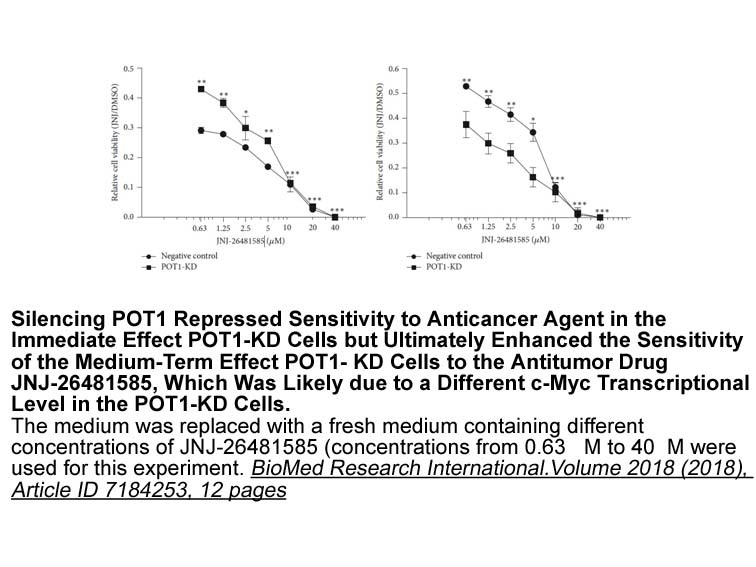 JNJ-26481585, a selective inhibitor of Class I and II HDACs, exhibited prolonged pharmacodynamic effects in vivo and displayed higher antitumoral efficacy as a signle agent. 2. Severe SMA mice show organ impairment that cannot be rescued by therapy with the HDACi JNJ-26481585. Eur J Hum Genet. 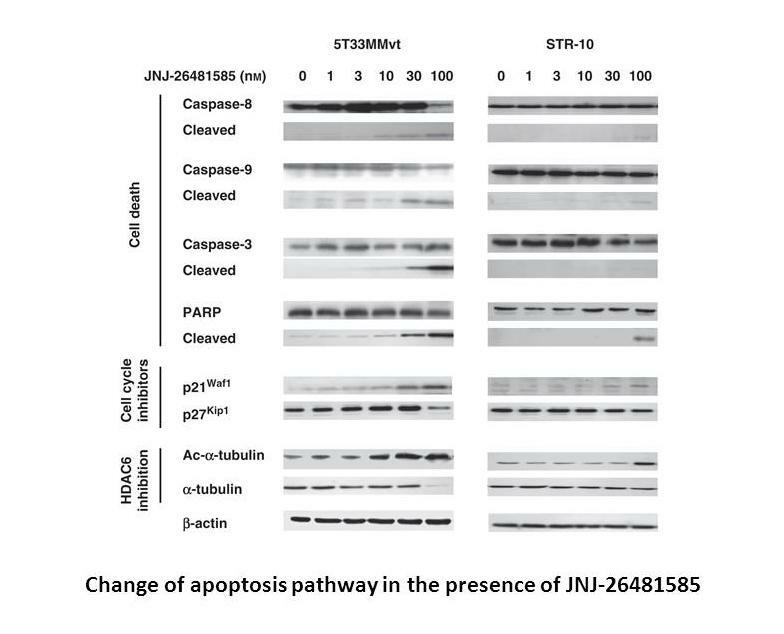 2013 Jun;21(6):643-52. doi: 10.1038/ejhg.2012.222. Epub 2012 Oct 17. JNJ-26481585, a pan-HDACi, up-regulated SMN levels in SMA fibroblast cell lines but failed to prolong survival in SMA mice despite mild improvements in motor abilities and weight progression. 3. 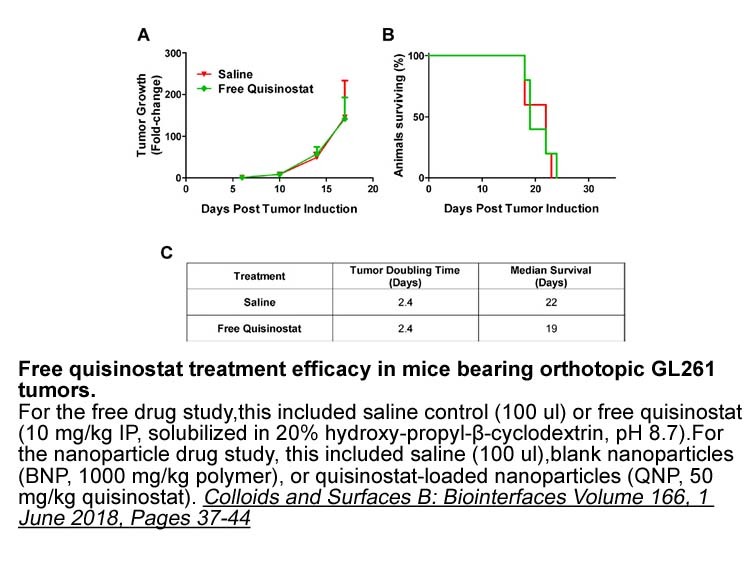 A phase I study of quisinostat (JNJ-26481585), an oral hydroxamate histone deacetylase inhibitor with evidence of target modulation and antitumor activity, in patients with advanced solid tumors. Clin Cancer Res. 2013 Aug 1;19(15):4262-72. doi: 10.1158/1078-0432.CCR-13-0312. Epub 2013 Jun 5. Quisinostat, a pan-HDACi, has been assessed for MTD, DLT and pharmacokinetic and pharmacodynamics profile. 4. 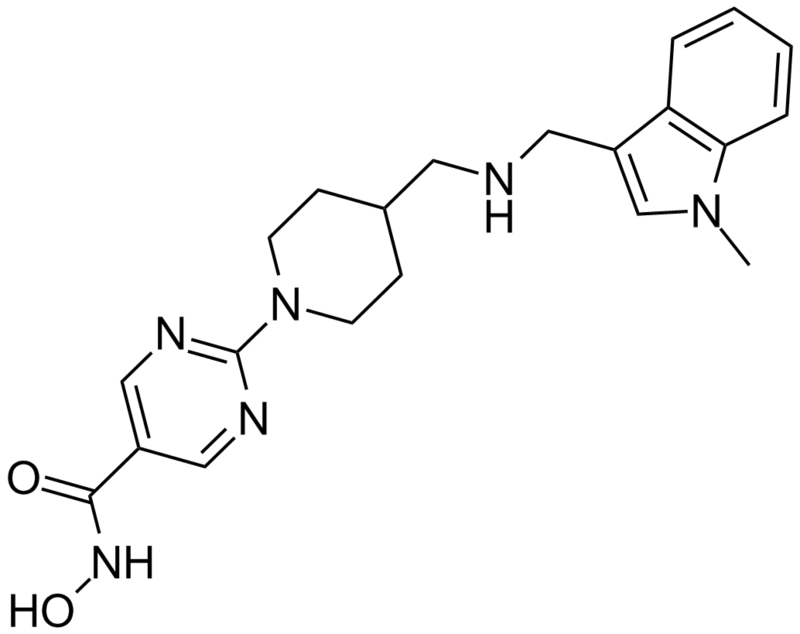 Preclinical anti-myeloma activity of the novel HDAC-inhibitor JNJ-26481585. Br J Haematol. 2010 May;149(4):529-36. doi: 10.1111/j.1365-2141.2010.08126.x. Epub 2010 Mar 13. The treatment of JNJ-26481585 resulted in histone acetylation, a shift in Bcl2-family members towards proapoptotic bias, attenuation of growth and survival pathway activity and Hsp72 induction in both human MM cells and primary MM samples, where Mcl-1 depletion and Hsp72 induction were two reliable features observed in primary MM samples. 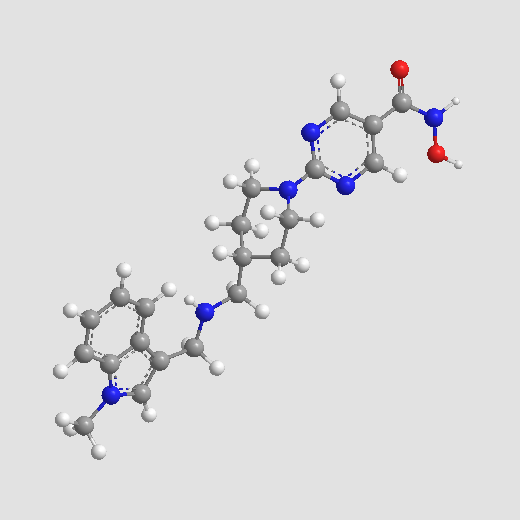 JNJ-26481585 alone or in combination with anti-myeloma therapeutic agents induced myeloma cell death. 5. Preclinical antileukemia activity of JNJ-26481585, a potent second-generation histone deacetylase inhibitor. Leuk Res. 2010 Feb;34(2):221-8. doi: 10.1016/j.leukres.2009.07.024. Epub 2009 Aug 13. JNJ-26481585 alone or in combination with decitabine exhibits anti-leukemia activity in leukemia cell lines and primary human leukemia cells.